I swear books like this speak to my soul. I know those are some serious words, but they are 100% true. I am a few weeks into my minimalist journey, and while I still have so far to go in minimizing my "stuff," I've already managed to reduce my stress. It feels so good to get rid of things. Too good, really. I have thoroughly enjoyed putting my "stuff" out at the curb. My neighbors love it, too--my things never sit outside very long. I'm sure they must think we are preparing to move out soon. SUMMARY: A nonfiction primer about how to reduce stress by reducing the number of things we own. REVIEW: I read this on audiobook. The narrator is fabulous. He isn't the author, but I thought he was until the very last part of the audiobook where they list the author and narrator's names. I've read that the printed book includes photographs, and I obviously didn't get to see them with the audiobook. I would be interested in seeing them, but I still got plenty from the book without seeing the photos. 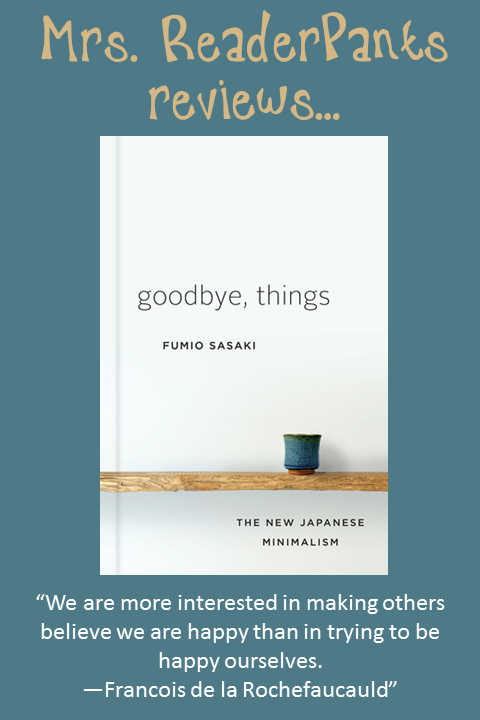 Goodbye, Things is a practical guide to living a minimalist life. Some of my favorite takeaways include the "one item in, one item out" theory of getting rid of the old thing when we buy something new. My husband just ordered some new winter blankets for our and our kids' beds. The non-minimalist me would normally keep the old blankets "just in case..." The new minimalist me will not only toss out the old blankets (or, more likely, donate them in a dropbox near our apartment); I will also find any older blankets I've hung onto and donate those as well. I don't need an old winter jacket if I buy a new one, and I don't need my old sneakers when I buy a new pair. There is no "just in case." I literally never need an old pair of sneakers. Ever. I also like the sections about doing things or buying things to impress other people. I do this, and I know I do it. This book makes me think about why I'm doing things, and if it is only to impress others, it's going to have to stop. If the major benefit of doing something or buying something is to impress others, I'm at least more aware of it now. THE BOTTOM LINE: Recommended for anyone interested in reducing stress and living a more minimal life. Recommended for everyone, really. STATUS IN MY LIBRARY: We don't have it. It is something I would buy, but with my limited budget, I don't think it is the best bang for my buck right now. If I had even one person who I though would be interested, I would buy it. Maybe I'll booktalk it this week and see what the reactions are. I think everyone should read it, even teens. I wish I had read it as a teen. Love minimalism? I have a Pinterest board for that!